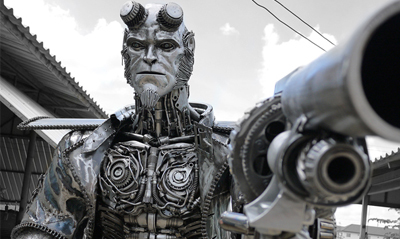 If your New Years Eve shindig had you thinking your backyard needed more of a centerpeice, then you might want to consider a steampunk version of the hottest supernatural hunter in town, Hellboy. 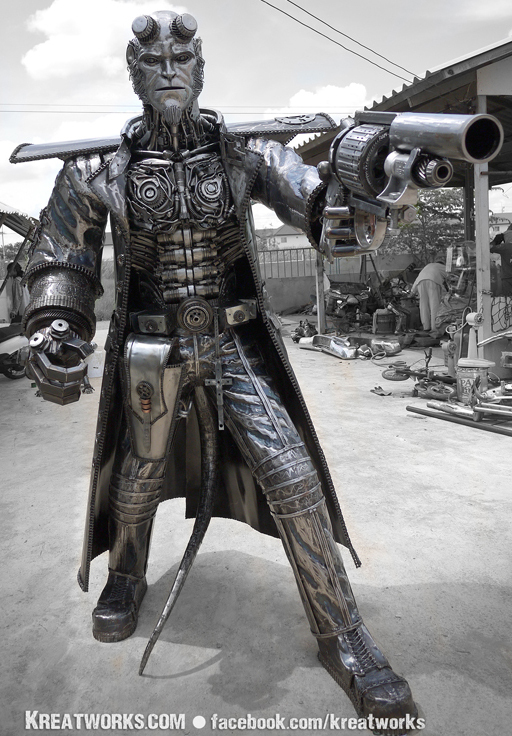 One of the sci-fi range available from the metallically talented peeps at Kreatworks, Thailand, Mike Mignola's indie creation turned recycled metal masterpiece has a coating to protect from the evils of rust and is made to order from 100% auto and machine parts. Weighing in at 230cm tall and 350kg, the price tag of $7,400 might make your beloved faint at first sight, but you really didn't need that romantic holiday anyway. To view the full range of Kreatworks steampunk styled contraptions, including Spider-Man, Alien, Predator and Jack Sparrow, click the jump. i've never been a big Hell Boy fan but i can certainly appreciate the creativity and attention to detail on this. cheers Dave! It sure would've taken some skill thats for sure!